Order 5 units could get one iPad Air. 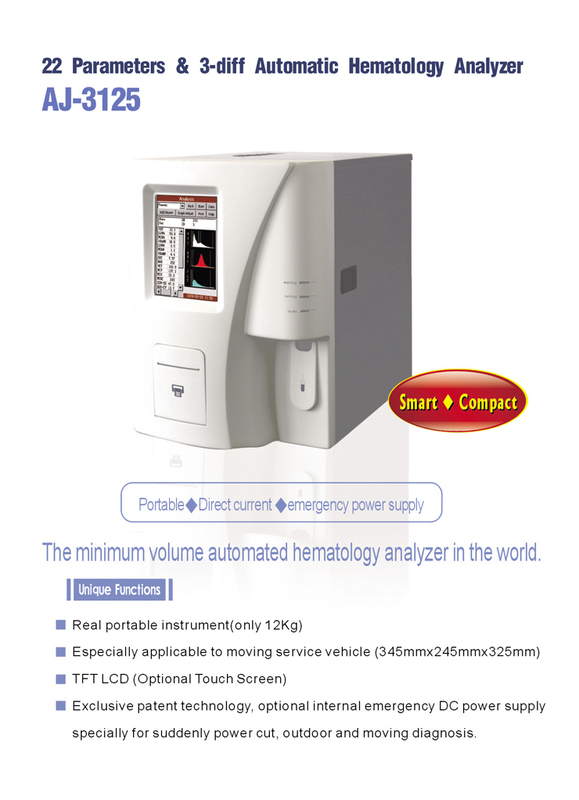 Why buy Auto Hematology Analyzer AJ-3125? 1. Portable with size 345x245x325mm, weight 12KGS. – Small and light, easy for showing to hospitals and clinics. Expect normal hospital and clinic, it will be also suitable for Medical Vehicles and outdoor Army Hospital. 2. The key parts Valve (totally have 11valves in side) are of high quality made inGermany. – Not blocked. 3. Inside pipeline is Saint-Gobain France Original hose. – It ensure long lifespan of the machine. 4. Using DC input – it could reduce interference and ensure the accuracy and stability of test. 5. Modular Circuit Board – Easy for maintenance. 6. Sleep and Wake Up automatically. – Conserve resources. 7. Aspiration needle retractable automatically. – Avoid pollution from long time exposure. 9. 60 test/hour; 400,000 test result storage. 10. Can match reference value automatically.